GANIYARI, India — It was 8 p.m. on January 12 at the Jan Swasthya Sahyog (Health Care for the People) clinic, and Dr. Yogesh Jain was examining one of the last patients of the day: a strikingly gaunt man stricken by malnutrition and diabetes. The patient, Jawaal Singh Gondh, is a construction laborer in Ganiyari, a rural town in Chhattisgarh, one of India’s poorest states, and one of the dozens of acutely sick people whom Jain sees every day at the charitable clinic. As Jain tended to Gondh, his knees jutted through too-large pant legs, like a child in his father’s clothes. Jain, a plainly dressed middle-aged man with salt-and-pepper hair, is a pediatrician trained at the All India Institute of Medical Sciences in New Delhi, one of the top medical research centers in the country. He now works as a community doctor and activist at the rural clinic in Chhattisgarh, a mostly agricultural state of about 24 million people in the hills of central India. In the absence of clinics like Jan Swasthya Sahyog, thousands of mothers deliver children in poorly equipped, dirty operating rooms. Patients often shuttle between private and public clinics in a Sisyphean quest to diagnose serious diseases. Over half of children under age 3 are underweight or malnourished, and the state has one of India’s highest infant mortality rates, with 48 of every 1,000 babies dying before their first birthday, according to a 2014 report published by the Bangalore-based research organization SciBiolMed. 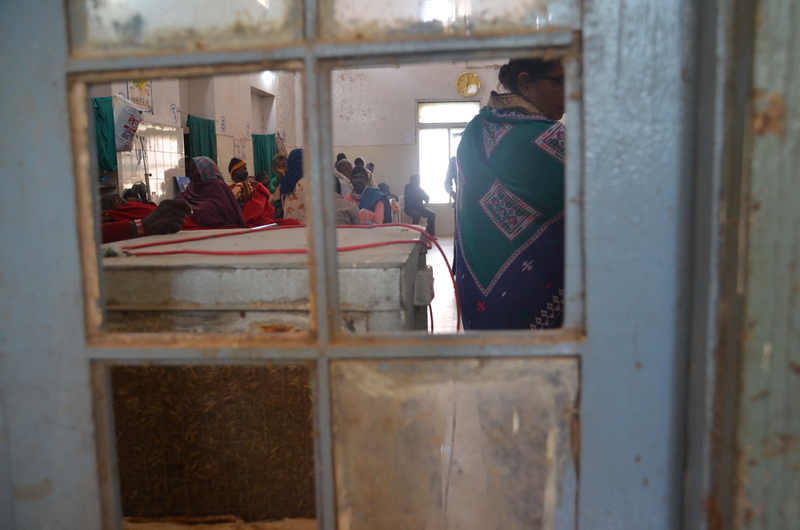 Most of the clinic’s patients travel hours by bus or on crowded jeeps from the tribal areas, India’s government-reserved regions for indigenous communities and tribes, who account for a little over 8 percent of the country’s 1.25 billion people. These are the poorest of India’s poor, the people who struggle most to receive health care. And with no safety net, they are extremely vulnerable to diseases like malaria, anemia, and malnutrition. Chhattisgarh is a disturbing sign that India’s government health-care system desperately needs more money. But in India’s annual budget, released on Feb. 28, the government once again failed to prioritize health care — allocating only roughly $5.3 billion for public health. India spends roughly 1 percent of its GDP on health care — less than half of that spent by the comparably sized economies of Brazil and Russia. And not only is $5.3 billion a drop from 2014’s budget of $6 billion, but it is not nearly enough to implement the National Health Policy — Prime Minister Narendra Modi’s ambitious plan, released in December, to expand health insurance and facilities. The government health-care system, a tiered network of primary-health clinics and specialized hospitals, is notoriously understaffed and poorly maintained. India has only one doctor per every 1,400 people — lower than its impoverished and chaotic neighbor Pakistan.India has only one doctor per every 1,400 people — lower than its impoverished and chaotic neighbor Pakistan. Sitting in his spacious office in the state capital Raipur on Jan. 14, Chhattisgarh’s health minister, Amar Agarwal, refused to accept that his state’s health system is underfunded. In fact, he said, they couldn’t even spend all the money New Delhi distributed — about $118 million from 2013 to 2014. Chhattisgarh, he continued, is one of the only states in India with some type of universal health insurance for families of all income levels. That in itself, he argued, gives people more power over their health. “They have faith in that purchasing power,” Agarwal said. The idea that Chhattisgarh has more than enough funding for health care is laughable, said Sakhtivel Selvaraj, a senior public-health economist with the Public Health Foundation of India, a public-private research and policy organization. If funds aren’t being used, he added, it’s because officials don’t have the authority or flexibility to use them when and where they are actually needed. And pinning hope on universal health insurance in Chhattisgarh seems unrealistic, especially since those who do have coverage under government insurance often have a difficult time when they try to get treatment. Finally, Yadav checked into Sankalp Hospital, a new private hospital in Ambikapur. Lying on a clean cot in the maternity ward after her Caesarean section on Jan. 10, the new mother could barely concentrate on the baby boy tucked under a blanket at her chest. Instead, she was fretting about the $300 hospital bill she would have to pay, since the hospital didn’t accept her government insurance. “We’ll have to borrow money and pay later,” Yadav said, lines of worry etched across her forehead. For patients like Yadav, the combination of a skimpier budget with continued poor implementation most likely means more struggling to see doctors, buy medicines, and pay bills.